November 1916: first stage appearance, at the Ichimuraza, where he receives the name of Nakamura Yonekichi III, playing in the drama "Hanakawado Uwasa no Manaita". April 1926: Yonekichi plays at the Hongôza the role of Ôboshi Rikiya in the classic "Kanadehon Chûshingura". October 1927: revival at the Hongôza of Tsuruya Nanboku IV's masterpiece "Sakura Hime Azuma Bunshô", produced under the title "Kiyomizudera Azuma Bunshô", which has not been staged since 3rd lunar month of 1817; Yonekichi plays the role of Yoshida Matsuwaka [casting]. October 1929: Nakamura Yonekichi III takes the name of Nakamura Moshio IV at the Meijiza. October 1933: premiere at the Tôkyô Gekijô of Yoshida Genjirô's drama "Nijô-jô no Kiyomasa"; Moshio plays the role of Toyotomi Hideyori [more details]. February 1934: premiere at the Kabukiza of "Ôishi Saigo no Ichinichi", the tenth and last play of Mayama Seika's cycle "Genroku Chûshingura"; Moshio plays the role of Hosokawa Naiki [casting]. December 1946: Moshio is a member of the Kabuki troupe which celebrates the reopening of the rebuilt Mitsukoshi Gekijô [more details]. January 1950: Nakamura Moshio IV takes the name of Nakamura Kanzaburô XVII at the Tôkyô Gekijô. This prestigious Edo zamoto name has not been holden since 1875. The new Kanzaburô plays the roles of Nakamura Kanzaburô I, Ichijô Ôkura Naganari and the Nakamuraza's zamoto in "Jôran Saruwaka-mai", "Ichijô Ôkura Monogatari" and "Kaozoroi Yagura no Nigiwai". Kanzaburô's stage partners are Nakamura Kichiemon I, Nakamura Tokizô III, Matsumoto Kôshirô VIII, Ichikawa Ebizô IX, Morita Kan'ya XIV, Nakamura Shikan VI, Onoe Shôroku II, Onoe Baikô VII, Ôtani Tomoemon VII, Bandô Mitsugorô VII, Ichikawa Danzô VIII, Ichikawa Omezô IV, Sawamura Tosshô IV, Nakamura Matagorô II, Nakamura Fukusuke VII, Bandô Hikosaburô VII, Ichimura Uzaemon XVI, Kawarasaki Gonjûrô II and Ichikawa Sanshô V.
May 1950: Nakamura Kanzaburô XVII celebrates his shûmei in Nagoya at the Misonoza with the troupe led by his brother Nakamura Kichiemon I; Kanzaburô plays the role of Kasugaya Tokijirô in the drama "Akegarasu Yume no Awayuki" (the role of Urazato is played by Nakamura Shikan VI). December 1950: Matsumoto Kôshirô VIII and Nakamura Kanzaburô XVII celebrates their shûmei in Kyôto at the Minamiza; Kanzaburô plays the roles of Toyotomi Hideyori, Hayano Kanpei, Omiwa and the tamaya Yonekichi in "Nijô-jô no Kiyomasa", "Ochiudo" (the role of Okaru is played by Nakamura Shikan VI), "Mikasayama Goten" and "Tamaya". October 1951: Matsumoto Kôshirô VIII, Nakamura Utaemon VI and Nakamura Kanzaburô XVII celebrates their shûmei in Ôsaka at the Ôsaka Kabukiza; Kanzaburô plays the roles of Yogorô/chôkichi, Shigaraki Tarô, Ichijô Ôkura Naganari, Togashi Saemon and Hayano Kanpei in "Sumôba", "Moritsuna Jin'ya", "Ichijô Ôkura Monogatari", "Kanjinchô" (the roles of Benkei and Yoshitsune are played by Matsumoto Kôshirô VIII and Nakamura Tokizô III) and "Ochiudo" (the role of Okaru is played by Nakamura Utaemon VI). November 1952: premiere at the Kabukiza of Kema Nanboku's revision of Chikamatsu Monzaemon's drama "Daikyôji Mukashi Goyomi"; Kanzaburô plays the role of the bantô Sukeemon [casting]. July 1953: premiere at the Meijiza of Hôjô Hideji's drama "Ukifune"; Kanzaburô plays the role of Niou-no-Miya [casting]. Revival at the Meijiza of Kawatake Shinshichi III's 1878 drama "Tsûzoku Saiyûki"; Kanzaburô plays the role of Songokû [casting]. July 1954: revival at the Kabukiza of the dance-drama "Oshidori" as part of a regular Kabuki program; Kanzaburô plays the roles of Kawazu Saburô Sukeyasu and the spirit of the male mandarin duck [more details]. November 1954: premiere at the Kabukiza of Mishima Yukio's comical play "Iwashi Uri Koi no Hikiami"; Kanzaburô plays the role of Sarugenji [casting]. July 1955: premiere at the Tôhô Takarazuka Gekijô of Uno Nobuo's drama "Mômoku Monogatari"; Kanzaburô plays the roles of Tôkichirô/Hideyoshi and Yaichi. February 1960: premiere at the Kabukiza of Uno Nobuo's drama "Shiranui Kengyô"; Kanzaburô plays the roles of the fishmonger Shichibei and the masseur Tominoichi, later Shiranui Kengyô II [casting]. June ~ July 1960: Kanzaburô takes part in the first Kabuki tour in the USA; He plays the roles of Togashi, Sawaichi, En'ya Hangan, Yamakage Ukyô, Tarôkaja and Jirozaemon in the dramas "Kanjinchô", "Tsubosaka Reigenki", "Kanadehon Chûshingura" "Migawari Zazen", "Takatsuki" and "Kagotsurube Sato no Eizame" [casting]. November 1961: premiere in Kabuki at the Ôsaka Shinkabukiza of Hôjô Hideji's drama "Korikori Banashi"; Kanzaburô plays the role of the priest Jûzen [casting]. June 1963: premiere at the Kabukiza of Hagiwara Yukio's Nagauta-based dance-drama "Ôeyama Shuten Dôji"; Kanzaburô plays the role of Shuten Dôji [casting]. Namiki Shôzô I's drama "Yadonashi Danshichi Shigure no Karakasa" is produced for the first time at the Kabukiza; Kanzaburô plays the role of the playwright Namiki Shôzô [casting]. May 1964: premiere at the Kabukiza of Hagiwara Yukio's Nagauta-based dance-drama "Bukaku Setsugekka"; Kanzaburô plays the roles of the spirit of the cherry blossoms, the insect and the snowman [casting]. October 1965: first Kabuki tour in Western Europe, in West Berlin at the Der Freien Volksbühne (2~8 october), in Paris at the Théâtre de l'Odéon (15~24 october) and in Lisbonne at the Teatro São Luis (29~31 october); Kanzaburô plays the roles of Shunkan, Kô no Moronô and Yayoi in Chikamatsu Monzaemon's drama "Heike Nyogo no Shima", the classic "Kanadehon Chûshingura" and the dance "Kagami Jishi" [more details]. November 1966: opening ceremony of the National Theatre in Tôkyô with the full length performance of the classic "Sugawara Denju Tenarai Kagami"; Kanzaburô plays the role of Kan Shôjô [casting]. May 1968: revival at the National Theatre of "Ura Omote Sendai Hagi"; Kanzaburô plays the roles of Yorikane, Kosuke, Yashio and Nikki Danjô [casting]. April 1971: revival at the National Theatre of Nagawa Shimesuke I's drama "Sumidagawa Gonichi no Omokage"; Kanzaburô plays the role of Hôkaibô [casting]. January 1988: Kanzaburô appears on stage for the last time, at the Kabukiza, where he plays the role of Shunkan in the drama "Shunkan"; he falls ill and has to be replaced from the 9th of January by his son Nakamura Kankurô. 16th April 1988: Kanzaburô dies in Tôkyô. Nakamura Kanzaburô XVII was an amazing kaneru yakusha of the Shôwa era. He was the actor of more than 800 roles. Nakamura Kanzaburô XVII's best roles: Shunkan ("Heike Nyogo no Shima"), Ichijô Ôkura Naganari ("Ichijô Ôkura Monogatari"), the hairdresser Shinza ("Kamiyui Shinza"), Sodehagi ("Sodehagi Saimon"), Sawaichi ("Tsubosaka Reigenki"). Nakamura Kanzaburô XVII was the first of this line to be an actor without being a zamoto. 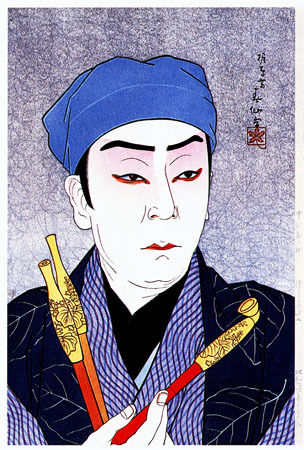 Nakamura Kanzaburô XVII playing the role of Tabakoya Genshichi in the drama "Komochi Yamanba"